What follows is a list of three Qt examples, designed with Qt/S60 in mind, but works fine on the desktop as well. Hopefully this will attract^Wprovoke more people to create, write, port apps to S60, especially since the Tower release makes our life much easier already. 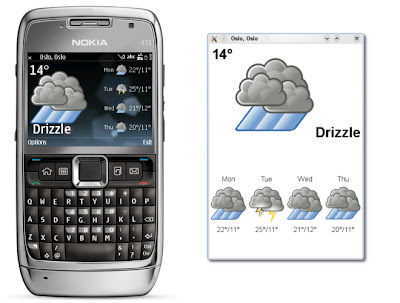 For each example, the picture shows how it does look like both on an actual phone and on the desktop. The code is available from the usual Graphics Dojo repository. All of them runs on the desktop, too (of course). Afterall, they are just normal Qt/C++ programs. Thanks to my fellow Troll, dboddie, some of them are already available (or being converted as we speak) to PyQt, for all the Python fans out there. Also, screenshots are so prehistoric and we are the YouTube generation, so another fellow Troll, aportale, agreed to spend few minutes of his precious lifetime to play the Producer, Cameraman, Propman, Editor roles (all at the same time) and publish the Director's Cut versions of all videocasts mentioned here. Long live the Trolls! 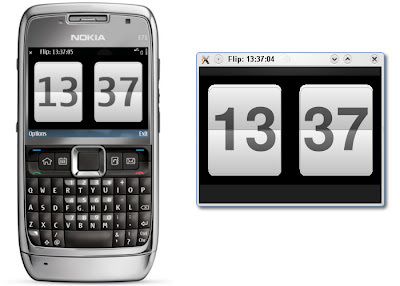 The first is the easiest one: flipping digital clock, where the digits flip as they change. 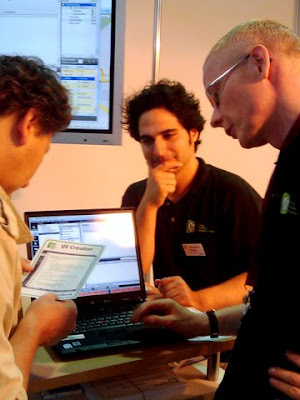 There are probably tons of implementations out there (do we have one for KDE 4? ), but if you are ever so curious to find out how useful QTransform could be, the check it out. For the lazy, watch the 23-second YouTube video. Next is yet-another-weather tool. This time I relied on the unoffical Google Weather API. 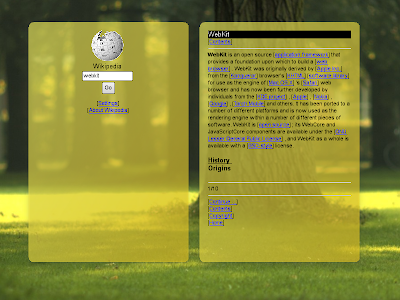 Nothing too fancy here, just a bit of SVG and Graphics View here and there, along with a bit of animation. The lazy side of you can go straight to stare at the 34-second demonstration videocast. 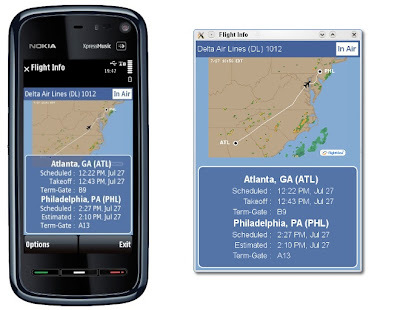 The last one is (just the next logical step to the second one): flight tracking tool. Based on flightview.com, the video can be checked on YouTube, too. It looks a bit ugly and it's also pretty limited, but hey, dogfooding your own app on your phone is also not bad. 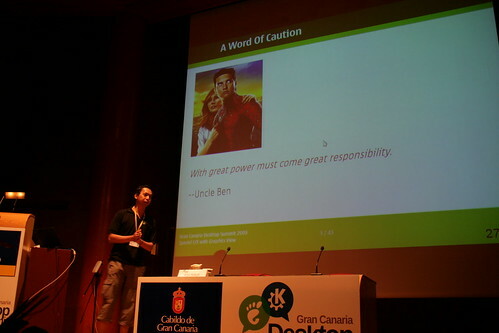 Every now and then, when I attend a conference, I try to analyze the way the best talks are delivered (and not only the contents). After that, I make a mental note of certain points of the important skills that the speakers successfully demonstrated. What I list below however is something difference. It's the exact opposite. I write down few minus points of my own talks (and from others, too) which do not match to those good traits of an excellent talk. First thing first: the accent. For me and others non-native speakers, it is difficult to speak English without any accents. In the best case, a presentation delivered with a strong accent would mean few parts here and there are not understood by the audience. This is usually not a big problem as (most of the time) our brain can interpolate the missing part. In the worst case, the audience can not understand the talk at all. Even worse if the presenter talks very fast like a machine gun. Still language-related: the unnecessary pause. This is best illustrated with an example: "Akademy is ... ehm ... a conference for ... ehm ... KDE developers and .. ehm also contributors.". The flow of the talk becomes weird, the speaker seems to think more about the literal sentence rather than the overall idea. The best advice I got to reduce this problem to practice a lot. In addition, pretend that you are having a water-cooler chat with your fellow coworkers instead of addressing thousands of people. Spending time looking at the laptop and/or the big screen. The irony is that we usually do it when we are stuck with the same slide for few minutes. The slide does not change, yet we are just staring at it as if we expect some magic will happen. The audience is our friend, so we'd better look at them as we talk. Forgetting to engage the audience. Especially for a long talk, the presentation's attractiveness quickly wears off once we start doing the one-way conversation for more than 10 minutes. Usually this is easy to notice, just check if they start concentrating more to the laptops instead of paying an attention or watching the slides. In that case, some kind of a question or a quick informal poll typically helps to get the audience back on track again. Monotonic speech, something still closely related to the above point. In such a conference, the audience does not intend to enjoy a bed-time story, hence the importance of inserting surprises when appropriate, provoking some thrills, triggering a bit of drama, throwing jokes, and such other related acts. Never afraid to show some emotion, be it a frustration or an excitement. Letting the slides dictate the talk. We often forget that the slides are there to help us to convey the messages. It's not the actual presentation. It's just the outline of the book, it's not the book itself. Thus, the talk must not be as rigid as the prepared slides. Not seldom we need to carry out adjustments according to the situation, e.g. skipping some parts or elaborating points not detailed in the slides. Lack of passion. We definitely need to show that we are having fun doing the talk! How could we expect the audience to enjoy it if we do not express and shared the joy? To counter the above points, the key is the rehearsal, or rather tons of rehearsals. Often, checking out the video of your own talks helps a lot. 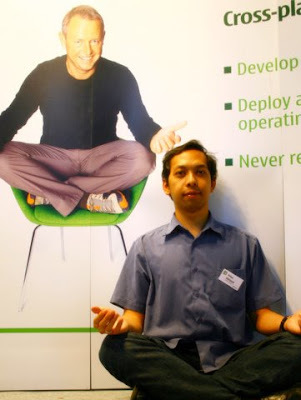 Of course, there are the usual advices of studying Presentation Zen, watching TED talks, keynotes from His Steveness, and many other online-available materials. Last but not least, regardless the way the talk is carried out, I still always thumb-up and respect those who have the courage to stand in front of many people and present their ideas. It's easy to give remarks on how good (or bad) a football player is, however it's far more difficult to actually play football in the real field under the scrutiny of millions of eyes. 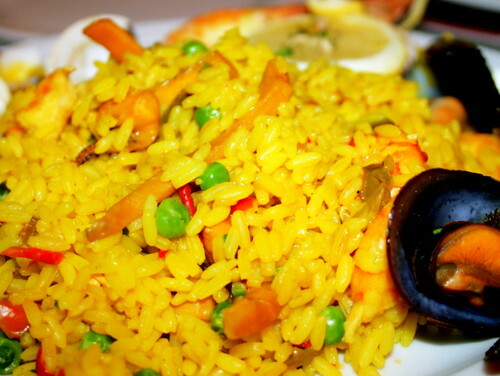 Also known as seafood paella, something we tried when we were in Las Palmas, Gran Canaria. Now I am motivated to cook it myself, sometime in the near future, in particular since I am also a fan of mussels. Coming back to Oslo (from LinuxTag in Berlin), apparently the heat wave which hits Europe was its peak, at least here in Oslo. To add insult to the injury, it does not really help if the ventilation system acts strangely, which it usually does right when you need it. 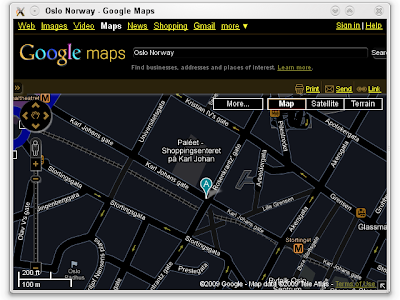 We sort of enjoy the rare moment when Oslo is warmer than most other places. In any case, Berlin was fantastic. There were already few blog posts (e.g. from Lydia, Chani, Sebas, Frederik) about LinuxTag so I won't write too much about it. I was very content with my talk since the room was quite filled when I was doing my presentation. The Qt booth was fun as well, I managed to have short chats here and there with the fellow Berlin trolls, KDAB guys, KDE people, and some other new contacts.